UNICEF/Joshua Estey A student at St. Francis of Assisi School and other girls, check their smart phones after classes in the Central Visayas city of Cebu, Philippines. The future of work is rapidly changing. With the rise of machines and automation, we need to empower our workforces with 21st-century skills to help them remain employable. But how do we empower billions of people who may have never set foot inside a classroom? How do we give them universal access to education and enable them to be future-ready? One of the biggest challenges we are facing globally today is how to close the rapidly growing skills gap. Experts from McKinsey and PWC estimate that between 30-50% of jobs will become the preserve of robots and AI in the next decade. If this is true, then we need to ask: what differentiates us from robots? What are our unique qualities as humans? And how do we leverage our strengths to remain relevant at scale? We need a fundamental disruption in how we are training and developing people for the 21st century. Learning has to be more about the soft skills than about memorization of terms or preparation for jobs that won’t exist. If it’s about complete rote tasks, machines can do these faster and better than we can. So what skills should we be training and developing? The good news is that we know what skills are needed to develop. The World Economic Forum published a list of the 10 skills needed to thrive in the Fourth Industrial Revolution as part of the its report The Future of Jobs. To simplify, I refer to this top 10 list as the 4Cs: critical thinking, creativity, communication and collaboration. These are the very skills that robots and AI still can’t do as well as humans. So how do we develop these 4Cs at scale and speed? In the Fourth Industrial Revolution, we need to redefine learning objectives and learn how to deliver content anytime, anywhere, to promote the idea of shared learning and a mindset of lifelong learning. 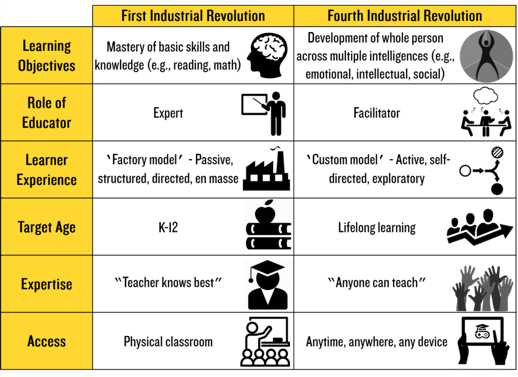 A chart comparing education approaches in the First and Fourth Industrial Revolutions. In order to scale these mindsets, we have no choice but to leverage technology to enable us to do this at scale and speed. Global unemployment rate among youth stands at 13% (3x higher than that of adults), according to the International Labour Organization. Time is of the essence. A new way of learning and teaching to develop the 4Cs. We call it MPPG: Mobile-first, Participatory, Personalized, Group-based learning. Given that more than 44% of the world’s population owns a smartphone, how can we harness this device to close the rapidly growing skills gap and empower people to take greater ownership of their own education? With the number of mobile users now greater than that of PCs, we need to design with a learner in mind who is most likely not sitting behind a PC but may be on the go. When designing for this mobile learner, we need content to be bite-sized, interesting, swipeable and accessible anytime, anywhere. This is the power of mobile-first versus mobile-responsive learning. With the level of stimulation people have grown accustomed to, the need to invite co-creation and participation is a critical part of developing the 4Cs. Ultimately, education should invite people to participate in their learning experiences – not just passively read articles or watch videos. When learners participate in their learning experience, it increases ownership of the learning, therefore increasing likelihood of application, which is the true value of knowledge. Learners need to develop critical-thinking skills to reflect on the challenges they face in the Fourth Industrial Revolution. When given the same challenge, each of us will respond differently based on our backgrounds and experiences, so let’s evolve beyond using overly simplified multiple-choice assessments to test knowledge. In a world characterized by VUCA – volatility, uncertainty, complexity and ambiguity – we need to develop critical thinking and judgment skills so that each person is empowered to form their own opinions and perspectives. Learning must give space for individuals to provide their own answers, so that learning is personalized and relevant to different contexts. After listening to a lecture, our takeaways will be different, so let’s create space and time for personal reflection in learning. Deeper learning takes places when adults debate, discuss and learn from each other and share their knowledge and experiences. This is sometimes referred to as “social learning”. Embedding group-based learning into the fundamental architecture of education is essential to encouraging “sharing” behaviors. Sharing and working in groups develops communication and collaboration skills. We are living in more complex, uncertain times, in an age where humans and tech are learning how to interact with each other. We are running out of time to develop 21st-century skills and mindsets, and close the growing employability gaps. We need to adopt new perspectives and ways of developing skills at scale. Based on the latest available science of adult learning, MPPG provides a practical framework for moving us in the right direction.